My New Year’s Resolution: I resolve not to make any resolutions. Well, that was easy! Simplistic, though, and trite. Not so good. We’re pretty well into the first month of the new year and I’ve been pondering the whole ritual of resolutions for a while now and I still think that I’ll keep my resolution to not make any resolutions. The whole ordeal has become so shrouded in an aura of failure that it seems self-defeating to even try. Hmmmm- key words there: failure, self-defeating, try. Last year I had a list of goals instead of resolutions because there were a lot of things I wanted to accomplish. I don’t know if it was a more positive way of phrasing it or the fact that I had a more goal oriented approach to what I wanted to accomplish or if I was just more motivated but, either way, it worked- mostly- and I’ll take that. He put into words the whole continuum of what I was able to accomplish last year and want to follow though into this year and beyond. My life as a growing and learning experience IS a continuous process and there are still SO many things to learn and discover. To paraphrase Donald Rumsfeld, you know what you know and you know what you don’t know but you don’t know what you don’t know. Yeah! So I’ll keep working on what I know and keep trying to teach myself the things I don’t know but it’s the things I don’t know that I don’t know that hold so much allure. What amazing things are out there just waiting for me to discover them?? Isn’t that something to look forward to??! I’ll be working on an attitude of gratitude (since I’m typically pretty pessimistic), improving my diet (no snacking, less craft beer) and lifestyle (improve my sleep, move heavy things and get ready for 10-12 mile hikes in Virginia in October), fermenting anything that’s not tied down (I applied for the fermentation residency being held this spring with Sandor Katz, the master of all things fermentation), playing more music (not accomplished at all last year and that’s sad but we did hear an amazing amount of great music and discovered artists we’d never heard of), getting more organized in the garden (succession planting has been beyond my organizational abilities) and, lastly, there are the things I don’t know I don’t know and, hopefully I’ll discover some of those, too. Here is a great post by Dr. Sarah Ballantyne about breaking bad habits and forming good ones. She puts to rest the old wive’s tale about it taking 21 days to make or break a habit. One of my big accomplishments last year was that I completed a Whole30! It was great; I felt good, I lost 9 pounds, I was practicing yoga. And then it was over. The holidays kicked in and all of the attention I had directed to myself went out of the window, or somewhere, I’m not sure where but without even realizing it, I completely backslid to pre-Whole30 habits. Now I realize that I hadn’t committed enough time or energy to establishing the changes I wanted to make. Change is hard and takes commitment and consistency but I am worth it. Now, with more mindfulness, I’m going to be the change I want: I can make better choices and lead by example even if no one follows me but me. I will show up in my life! I was listening to Outlaw Country on Sirius satellite radio on my way to work the other day and heard a song that really spoke to me about all of these things: “We are who we are, not who we’re gonna be/ Every passing moment is ancient history”. It turns out that it was written by a couple guys that live over on the east side of town, Peter Cooper and Eric Brace. Check it out. Here’s “Ancient History”. My New Year’s wish from my Dad was “Eat, love and listen to great music.” and so far that’s exactly what we’ve done. We celebrated our 15th anniversary with a New Years’s Eve concert at the Ryman with The Carolina Chocolate Drops and Old Crow Medicine Show after an amazing dinner at Capitol Grill. 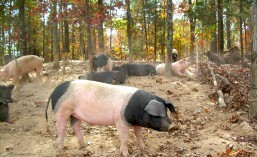 Chef Tyler Brown outdid himself and knowing that he uses biodynamic gardening principles in the Hermitage Hotel’s garden and raises his own beef at HH Farm made it even better. New Year’s Day was spent around a fire with good friends and good food, including the delicious (and obligatory) cabbage and black eyed peas so we know we have our good luck and prosperity covered for the new year. 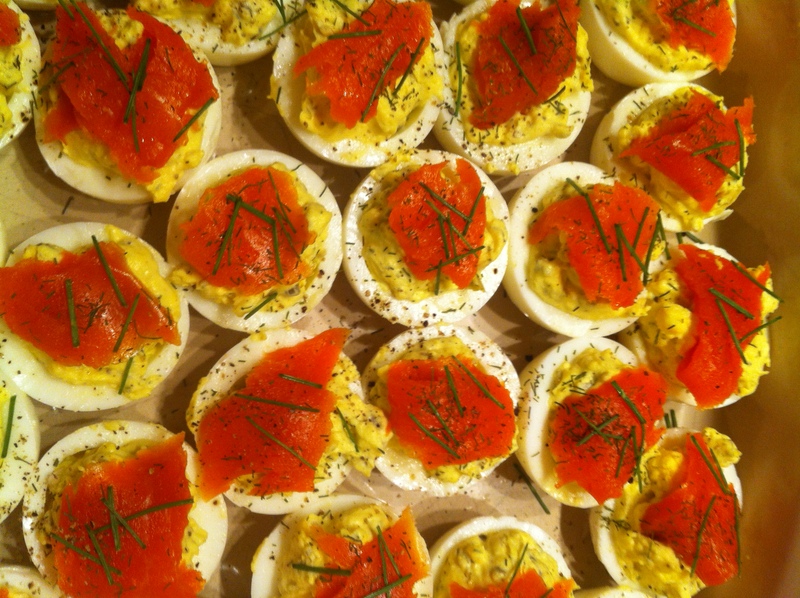 Our contribution to the party was Smoked Salmon Deviled Eggs. I’m not a big fan of egg whites so I was pretty enthused when I saw someone cutting their deviled eggs around the middle instead of longways. It lets you cut some of the egg white away AND gives you the advantage of extra stability since they’re not sliding all over the place when you transport them. If possible, buy eggs at least a week before making these; older eggs are much easier to peel. Place eggs in a large pot with enough cold water to cover by one inch. Bring to a boil, stirring once or twice. Reduce heat to a slow simmer and cook for 11 minutes. Drain eggs then place eggs in ice bath until cold, 30-45 minutes. Crack eggs all over until completely crackled then peel, starting at the small end. Rinse and set on a towel to drain. Cut eggs in half around the equator, rather than the traditional long-wise cut. Remove yolks and place in a medium sized bowl then slice a small piece from the round end of each egg white so it will sit flat. Don’t worry if you cut too much and there’s a hole in the bottom. the filling is thick enough that no one will know. Mash yolks with a fork then stir in remaining ingredients. Taste for salt and add either caper brine or salt if it needs it. Spoon yolk mixture into each egg half. Tear smoked salmon into pieces and place on top of stuffed eggs. Garnish with a sprinkle of dill and chopped chives.